- Mildly increasing taxes on the rich and adding a few regulations and social programs to help the poor and stabilize the middle-class (keeping the U.S. from becoming a nation of just the super-rich and the poor, which is what current trends point toward) is not right out of the Communist Manifesto, which would call for the complete overthrow of the rich. - Communism fails with it’s overkill (total equality and shared ownership) and it’s weakness for totalitarianism; but democracy-based socialist-leaning government programs have worked out perfectly fine in countries such as the UK, Canada, Australia, New Zealand, etc. – democratic Commonwealth nations with similar lineages and moral backgrounds to the U.S. that manage to balance pure capitalism with level-headed social-welfare initiatives, universal healthcare, union support (fair wages), and the occasional slap at monopolistic practices without dramatically hindering business growth. - And, look, realistically, outside of the election-time histrionics that prompt people to imply otherwise, the fact is that even if the Dems raise taxes for everyone – not just a slight increase to those making over $250,000/year as promised – the most we’ll be looking at is a minor tax bump, a few percentage points, not the end of the world. - And, again, someone has to pay for the war and the financial bailouts. Cutting back on pork-barrel spending (e.g., state infrastructure projects) is not enough; at some point we have to pay the piper, and that’s going to mean taxes. The Bush dream of dumping millions into the war without raising our taxes can only be sustained for so long. Raises taxes during wartime is sensible; putting ourselves into deep debt with the totalitarian-communist Chinese government is not. So Obama will likely get stuck being the tax-man bad guy in order to balance our books; and then a Republican can come in and lower taxes and start racking up debt again. Then you can elect Palin in 2016 and she can destroy the economy and start the cycle over again. This Sisyphus-like practice is the American way. Tiresome, but probably healthy as it adds counterbalance, with each party balancing out the other party's excesses. But the GOP scare-tactic of making people fear that Obama is going to turn the U.S. into a Communist state is absurd; clearly the U.S. government doesn’t work that way (if it did, then we’d also have to worry about the extreme-left’s claim that Bush is planning to stage a terrorist attack and declare martial law so he can make himself president for life). "I'm a lifelong Republican - a supply-side conservative. I worked in the Reagan White House. I was the chief economist at the U.S. Chamber of Commerce for five years. In 1994, I helped write the Republican Contract with America. I served on Bob Dole's presidential campaign team and was chief economist for Jack Kemp's Empower America. This November, I'm voting for Barack Obama. When I first made this decision, many colleagues were shocked. . . . "
fundamentals that helped the economic boom time of the Clinton years, that's fine. But it's inarguable that the Bush Jr. years have resulted in massive debt and economic turmoil. One look at the state of the stock market and the 401k accounts of employees from across the U.S. brings this financial instability home on a personal level for millions of hard-working Americans. - It's hard to blame the current Democrat-controlled Congress for not getting much done, considering they've only held power for two years, they've only had a very slim majority, and they're up against a destructive Executive Branch. If the Dems gain a filibuster-proof majority on Nov. 4 and a Democrat in the Executive Office and are still unable to get things done over the next couple of years, then we can lay blame at their feet. - Despite fear-mongering to the contrary, the Alternative Income Tax will be adjusted for inflation so as not to affect the middle class. That's part of Obama's tax plan. - If Obama turns out to be another FDR, I'd consider that to be a good thing. I don't get how the far-right is managing to use FDR as a socialist bogeyman. like this on a national level instead of just supporting Alaskans, she might even get my vote (well, not likely, but it would make her seem more favorable). the GOP are not entirely clean on the Fannie and Freddie Mac issues. " 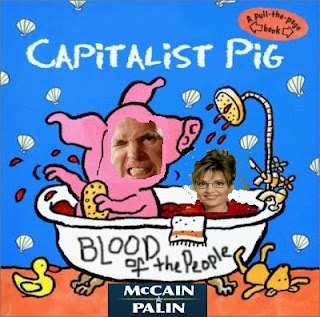 Freddie Mac in 2004 as chief of staff, has given $32,250 to Republican candidates over the years, including $2,800 to McCain, and has given none to Democrats, according to the Center for Responsive Politics, a nonpartisan group that tracks money in politics." "Finding the new driver of our economy is going to be critical. There is no better potential driver that pervades all aspects of our economy than a new energy economy ... That's going to be my No. 1 priority when I get into office, assuming obviously that we have done enough to just stabilize the immediate economic situation. We've got a boat with a lot of leaks, and we need to get it into port. That's what the financial rescue package is about. But once we get it into port, once the credit markets are functioning effectively, then it's time for us to go back to the fundamentals of this economy." "The point I was making was twofold. Number one, I want to give you a tax cut sooner so you can save sooner to start your business sooner, because the average plumber starting off sure isn't making $250,000 a year. And the second thing is, plumbers, like everybody else, need customers. And if everybody's broke, you're not going to be able to build your business ... It's a simple principle that we've lost, which is that when everybody's sharing in our prosperity, everybody wins."